Unique in the world with electrical isolation transformer for safety operator and animal . Entirely in stainless steel and 21mm colorless stratified tempered glass. 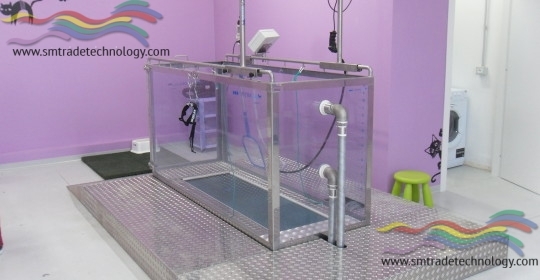 HYDRACare Jogging and the most complete watertreadmill in the field of rehabilitation through hydrotherapy. Along with rehabilitation, it can also be used for fitness training and weight control. Together with dogs, it is ideal for other small animals / pets. The natural buoyancy of water helps reduce impact but at high intensity. This is particularly important in patients with post-traumatic recovery. 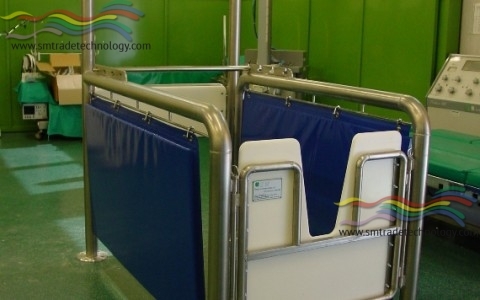 With the water temperature up to 38 ° C and the adjustable water level, it makes rehabilitation, fitness training or weight control a rewarding and happy experience for dog for owner. The New Design with crystal glass and white platform, blends with the environment in hospitals or in the most elegant homes, “complete is technological”. With the desire to give its best, HYDRACare Jogging symbolizes a robust and easy-to-use quality product, both for the operator and for the small user. Bath Capacity Lt. 1700 (corresponds to about 85 cm of water over the carpet). The whirlpool with compressed ozone air and countercurrent swimming .